The things I do for you, my readers. Even though it was over 100 °F in the Belm Utility Research Kitchen yesterday, I cooked something. It was simple to prepare, but still involved all four stove burners and whole lot of pots and pans. It’s been many years since I last sweated out a meal in this kind of weather, but I think it was worth it. While taking inventory of the Deep Storage Facility, I realized I still had three confited duck legs left from the batch I made in April (three were sautéed, two became rillettes). I wanted to balance the richness of the duck with something bright and herb-y, which put me in mind of shredding the duck and serving it in herb crepes. 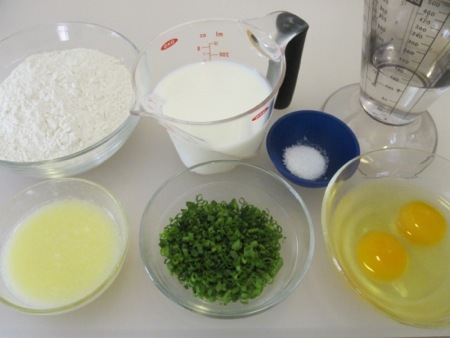 I assembled the ingredients for a crepe batter (based on Alton Brown’s recipe): flour, milk, water, eggs, salt, chopped chives, and melted butter. I unceremoniously dumped everything into the blender and mixed for about 15 seconds. While the batter sat in the fridge for an hour (during which time the flour hydrated and the air bubbles escaped) I pulled together the rest of the components, inspired in part by a duck roulade I had made for one of She Who Must Be Obeyed’s birthday dinners. 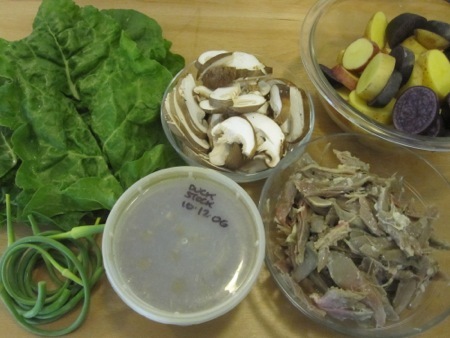 I rinsed and de-veined three large chard leaves, sliced shiitake mushrooms and mixed baby potatoes, thawed some duck stock, trimmed a handful of garlic scapes, and shredded the meat from the duck legs. Sadly, the skin disintegrated, denying me a crispy skin garnish. I simmered the stock to reduce it a bit, and boiled the potato slices for about ten minutes before drying them on paper towels. 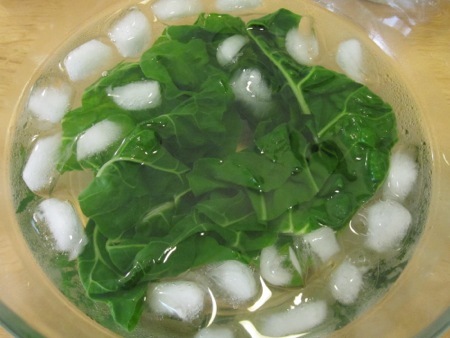 While the stock and potatoes were busy, I blanched and shocked the chard. It was so hot in the kitchen that the fat in which the legs had been stored needed less than an hour to liquefy. 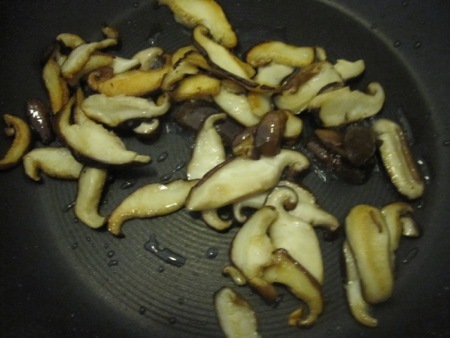 With all of that readily available fat, there was no need to use butter or oil, so I sautéed the mushrooms in duck fat. 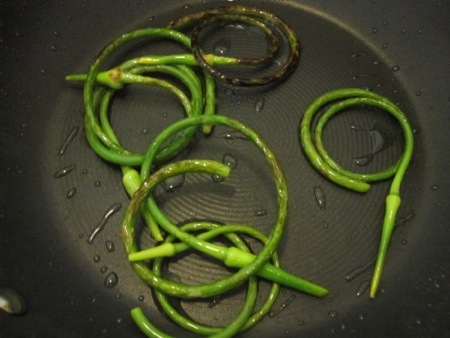 I followed the mushrooms with the scapes and more tasty fat, making sure to get a good char on part of the stems. I didn’t have to worry about keeping the various components warm – did I mention the kitchen was hot? I added the mushrooms and shredded duck to the reduced stock, let them simmer for a bit, and then corrected the seasoning with a splash of merlot vinegar, which added brightness and acidity. 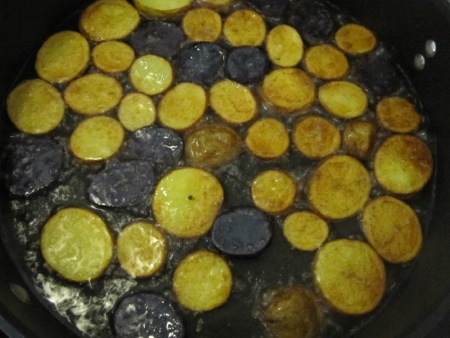 I poured a generous amount of – you guessed it, duck fat (seasoned, I should mention, with the salt, garlic, and herbs from the confuting process) – into a large pan, tossed in the potatoes, and let them get nice and crispy. While the potatoes cooked, I made a few crepes, a skill that came back to me rather quickly after years of banging out shells for Mom’s manicotti recipe. 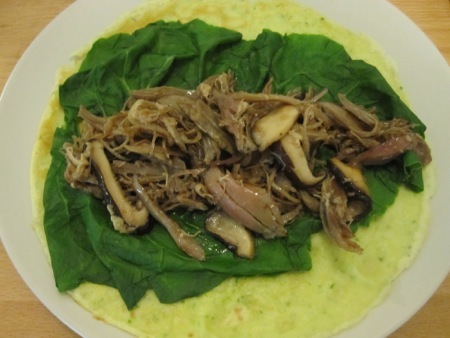 I drained and seasoned the potatoes, then assembled the crepes by layering each one with a chard leaf and a large spoonful of the duck and mushroom filling. 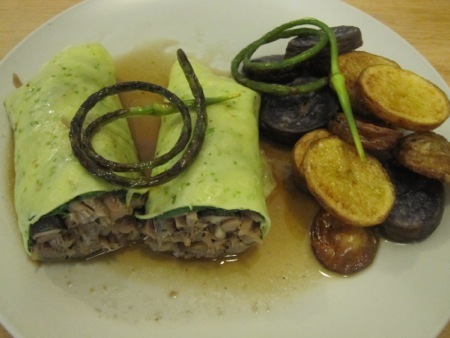 I rolled up the crepes, cut them in half, added a spoonful of the remaining duck stock sauce, plated the potatoes, and garnished with the scapes. The crepes were light and onion-y, the chard had a slight bitter note, the scapes provided a nice garlic hit – they all worked to balance the earthy duckiness (duckitudinosity?) of the filling. And you can never go wrong with duck fat potatoes. If you have been on the fence about making duck leg confit, this dish should convince you to give it a try. It’s a simple procedure, and eventually you get to “throw together” soothing like this. 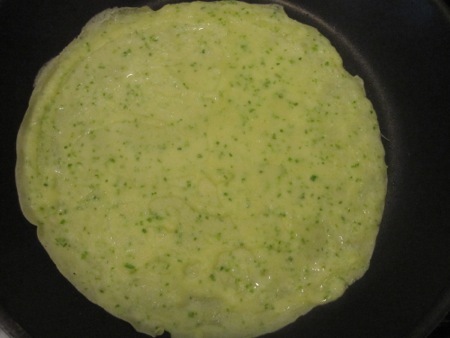 I make crepes based on Rose Levy Beranbaum’s recipe, which replaces flour with corn starch. 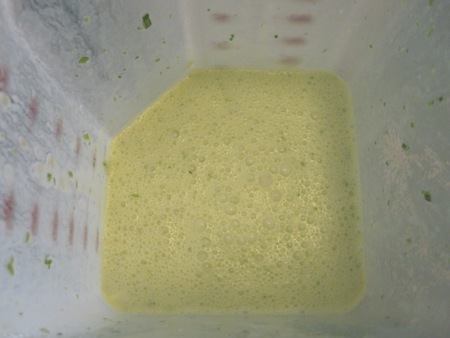 She says it hydrates faster and more thoroughly, makes a slightly sturdier crepe, and tastes the same. I don’t make crepes often enough to know if the last is true, but they are *really* easy with corn starch. Given that it took less time to mix the crepe batter than it did to measure out the ingredients, I don’t see any particular benefit to corn starch. As long as you use a blender and let the batter rest for an hour (recommended by none other than Shirley Corrhier) The creases turn out perfectly.